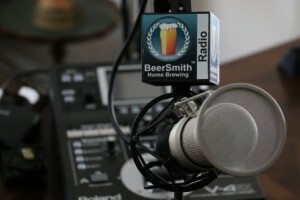 Today my guest is Sean Paxton, also known as “The Homebrew Chef”. Sean is a professional beer chef, author and runs a very nice food-beer pairing website at HomebrewChef.com. Sean joins me this week to discuss pairing food with beer. We discuss the anatomy of a beer dinner and some recent examples Sean has been the chef for. Sean explains “The Paxton Project” which is a several year old Imperial Quad beer and how he got involved in the project with 10 barrel. We talk about his food pairing selection for an Imperial Quad (duck) and how he prepared that. We talk about how he tries to reflect the flavors in the beer rather than complementing them when building a meal. Sean shares why he likes to cook with beer and also the ingredients of the beer when building a meal. He shares his latest project – the online web site and offers a special code ‘beersmith’ you can use at HomebrewChef.com to get a discount on memberships. Sean provides his closing thoughts. Thanks to Sean Paxton for appearing on the show and also to you for listening!